ST. PETER, Minn. – The Gustavus Adolphus College women’s hockey team finished its regular season with a tie against the Hamline Pipers on Saturday at Don Roberts Ice Rink. With the tie, the Gusties finish their season 9-11-5 overall and 8-6-4 in the MIAC, while the Pipers become 9-13-3 overall and 6-10-2 in the league. Going into today’s contest, Gustavus held the No. 5 seed with 19 points, one ahead of the Saint Mary’s Cardinals. With the Gustie tie today and Saint Mary’s defeating St. Kate’s 2-0, both Gustavus and Saint Mary’s finished with 20 points in the final regular season MIAC standings. However, because the Gusties and the Cardinals split their regular season series, the team that held the most MIAC wins advanced. The Cardinals had nine conference wins at 9-7-2, while the Gusties had eight at 8-6-4. This marks the first time since the initiation of the MIAC Playoffs in the 1999-2000 season that Gustavus has not clinched a spot. After a 9-3 loss against the Gusties last night, Hamline was first to get on the scoreboard on Saturday. On the power play, Hamline’s Jaci Reinke rebounded a shot by Megan Lawry and put it in the net at 11:31 of the first period. It appeared the Gusties would have great opportunities to knot the score in the remainder of the first, as the Pipers received five penalties and were down at least one skater on two separate occasions, but the Gusties were not able to convert on the power plays. In the second period, the Gusties had many shots that came close to scoring, but could not get the puck past Piper goalie Jamie Hathaway until the final minutes of the period. At 18:26, Diana Draayer (So., Deephaven, Minn.) scored after rebounding Emily Reibert’s (Sr., Inver Grove Heights, Minn.) initial shot that deflected off of Hathaway’s pad. Neither team was able to break the 1-1 tie in the third period and the game was forced into a five-minute overtime. 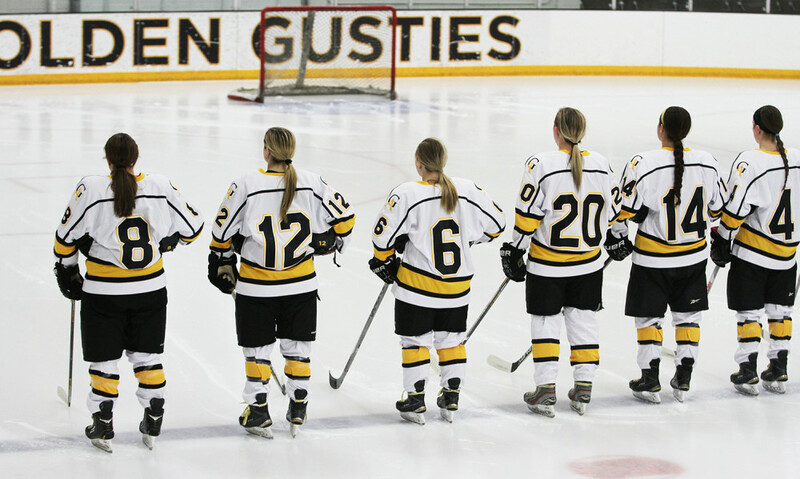 Gustavus was not able to muster a shot in the extra frame, and the game ended in a tie. The Gusties outshot the Pipers 37-25 and Gustavus goalie Amanda DiNella (Fy., Oakbrook Terrace, Ill.) earned the tie after making 24 saves. The game was the last for Gustie seniors Lindsey Hibbard (Princeton, Minn.), Reibert, and Allison Eder-Zdechlik (Stillwater, Minn.). Hibbard finishes her career with 3,900:33 minutes logged and a goalie record of 46-12-5, the second most wins in program history. Reibert concludes her career with 104 games played, 12 goals, 12 assists and 24 points. Eder-Zdechlik finishes her career as one of the top offensive players in the program, as she rankes No. 5 in program history with 58 goals and No. 12 with 95 points. Thank you Hibby, Reibs, and EZ for your 4 years of hockey and friendship at Gustavus. I am sorry your senior year did not go as planned. It was great getting to know all of you and your contributions to Golden Gustie Athletics will not be forgotten. See you in the Caf.